Figure 1.48. 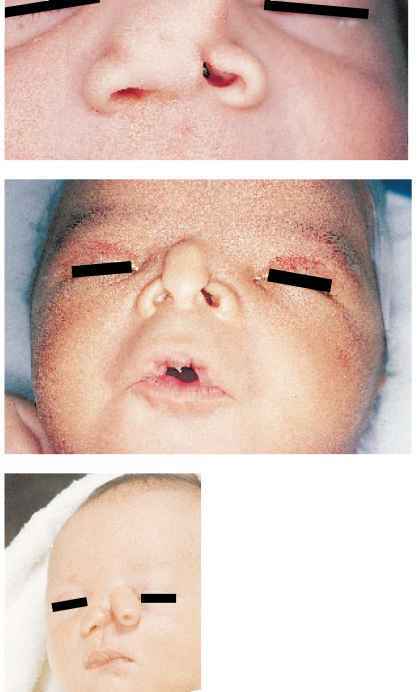 A more severe example of a lateral nasal cleft in an otherwise normal infant. Figure 1.51. Proboscis lateralis is a congenital abnormality in which the nose fails to develop normally. Figure 1.49. Although lateral nasal clefts, in general, are isolated findings, this infant in addition to the cleft had Holt-Oram syndrome (heart disease, in this case coarcta-tion of the aorta, and absence of left radius and thumb). Figure 1.50. 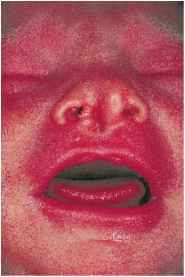 In this infant with bilateral clefting of the alae nasi, the philtrum is long and smooth because of the short nose. Note the downslanting palpebral fissures. There were bilateral cloudy corneas and congenital cataracts, a large anterior fontanelle and large metopic sutures. Karyotype was normal and MRI of the head was normal. Figure 1.52. Severe midline nasal schistasis. This was confirmed to be a communicating encephalocele on CT scan. Figure 1.53. This infant has the median cleft syndrome. Note the facial features which include median cleft lip, nasal depression, hypo-telorism, receding forehead, and microcephaly. A median cleft palate was also present. These findings commonly occur with alobar holo-prosencephaly as a result of underde-velopment of the brain. The majority of cases of holoprosen-cephaly are sporadic and may occur as an isolated anomaly, in association with chromosomal abnormalities (13, 13q—, 18p—), all in syndromes associated with arhinencephaly or holoprosencephaly. Figure 1.54. 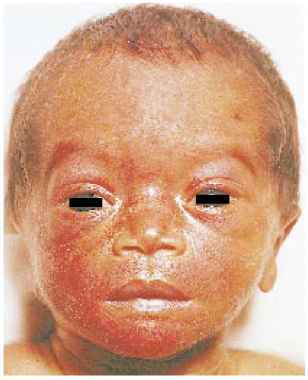 Lateral view of the same infant shows the microcephaly, receding forehead and chin, marked hypotelorism, and median cleft.